Attention Deficit Hyperactivity Disorder (ADHD) was for many years considered to be a disorder limited to childhood, but much progress has been made. In 2013, for example, key changes for adult ADHD have been adopted in the DSM-5, including the addition of age-adjusted descriptions of ADHD symptoms that are suitable for adults and an increase in the permitted age of onset, opening doors for those who were and are yet to be diagnosed. Currently, adult ADHD is widely recognised and estimated to affect 1.2–7.3% of the adult population worldwide. In contrast to these figures, however, many remain undiagnosed and only a small number of adults with ADHD receive suitable help, despite often having a long history of struggling. Why then, does it take this long for adult patients to be diagnosed and receive support, if at all? And how can QbTest and QbCheck provide an opportunity for these patients and those working with them? The recognition of ADHD as an adult disorder has been a major step forward, however, clinicians in both primary and secondary care continue to require support to identify and diagnose the disorder beyond the childhood years. Symptom similarities of overlapping disorders, including Bipolar Disorder and Borderline Personality Disorder, complicate the assessment process, as well as the often-absent developmental history and the difficulty patients have when reporting their symptoms. Adults tend, for example, to report the onset of ADHD symptoms an average of 5 years later than the actual age at which the symptoms started. Additionally, data from a study investigating hyperactivity in adults with ADHD suggest that they have difficulties to rate their level of hyperactivity on standardised rating scales (Adult Self Report Scale, ASRS) when compared to objectively measured hyperactivity. Figure 1. 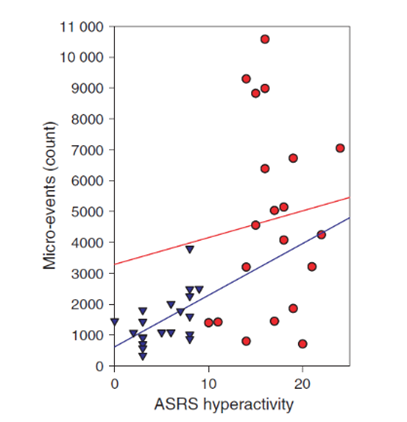 Scatter plots of Adult Self-Report Scale hyperactivity and number of Micro-events (which is an objective measure for hyperactivity provided in QbTest) for patients with ADHD (red circles) and healthy subjects (blue triangles). A statistically significant correlation between self-ratings and objective ratings was only found for the healthy subjects (p=0,006). Interestingly, a different study reported similar difficulties in rating levels of symptoms (Connors Adult ADHD Rating Scale-subscale E, CAARS-E) in adults with ADHD and Autism Spectrum Disorders (ASD). The two clinical groups showed similar levels of self-reported inattention/memory (despite there being differences in the objective measures of inattention), suggesting that they may not have an accurate perception of their attentional abilities. The study concurrently found that objective data from QbTest improved classification accuracy from 81% to 90% when combined with the two rating scales designed to assess ADHD (CAARS-E) and ASD (Autism Quotient, AQ10), compared with using the rating scales alone. Both studies shed new light on the opportunities of including objective data from QbTest in ADHD assessments, extending our knowledge about ADHD in adults. We therefore believe that a complete assessment of adult ADHD should include objective measures, such as QbTest and QbCheck, providing a better view of ADHD that empowers clinicians and patients.